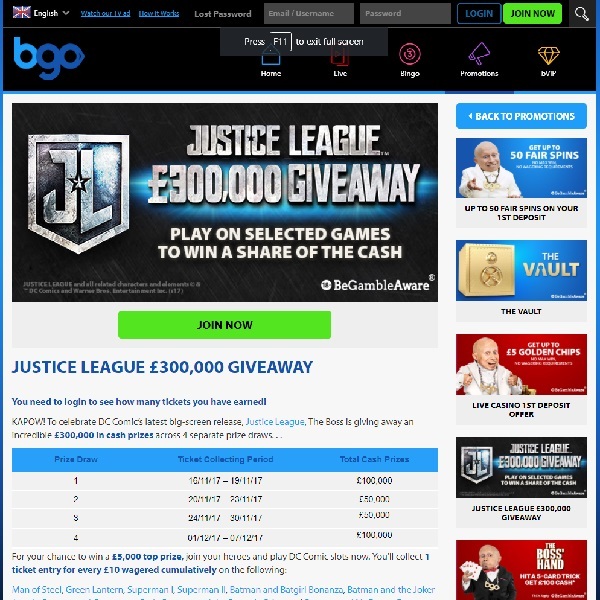 BGO Casino is running a £300,000 Justice League Giveaway promotion and you could win a huge amount of cash over the coming weeks. There are two prize draws remaining in the promotion, one taking place on the 31st of November with £50,000 up for grabs and one taking place on 8th December with £100,000 up for grabs. All you need to do is head over to the casino and start playing DC Comic slots. You’ll earn one entry for every £10 that you bet and you will get double entries for playing the new Justice League slot. There are top prizes of £5,000 available in both prize draws and each draw will produce thousands of winners. Make sure you don’t miss out, head over to BGO Casino and set the reels spinning on the DC Comic slots today.